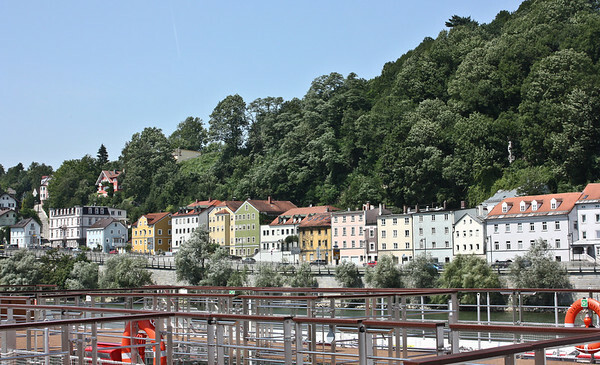 We were supposed to dock in Passau at 9:45 AM and spend two and a half hours walking around the town and attending a noon organ concert at St. Stephen’s Cathedral, before returning to the ship for lunch. You’ll find all my photos in this gallery. 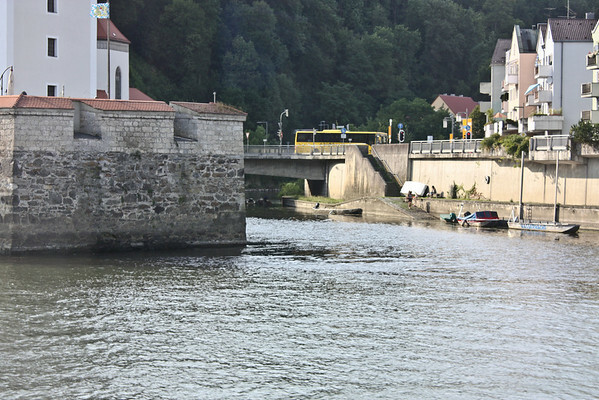 I’ve mentioned before that we had trouble with traffic jams at locks. 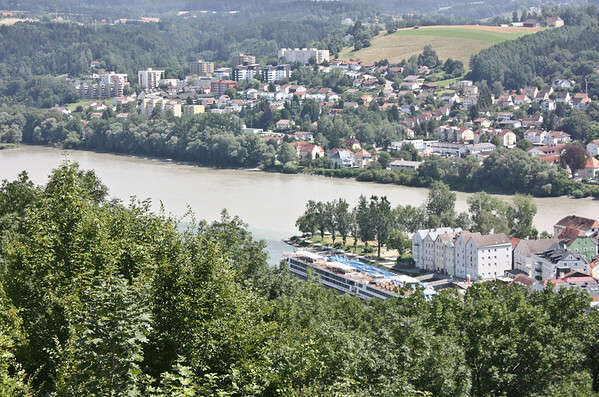 At 9:45 that morning we were stuck in a major traffic jam at (I’m fairly sure) the Kachlet lock on the Danube, just upstream of Passau. 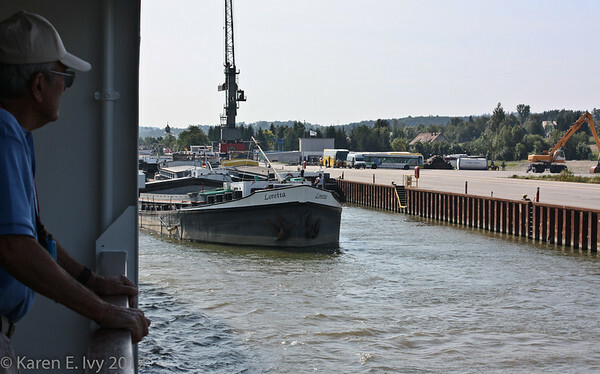 I don’t know exactly how long we stayed there; my diary says that “we” (the passengers) suspected the Embla of paying off the barge Loretta so they could use its dock long enough to offload the passengers into buses. No proof of this except a photo of the Loretta, floating near the dock. So we piled into buses and drove into town. 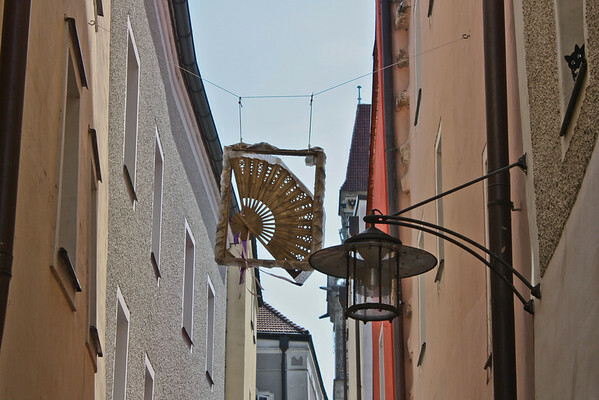 Passau is a very pretty town, but we only had time to walk down the Höllgasse (yes, that means Hell Alley) to the town square (Rathausplatz) and take a few photos of the Veste Niederhaus, part of the old town fortifications. I’ll show the photos of the Veste Niederhaus later. 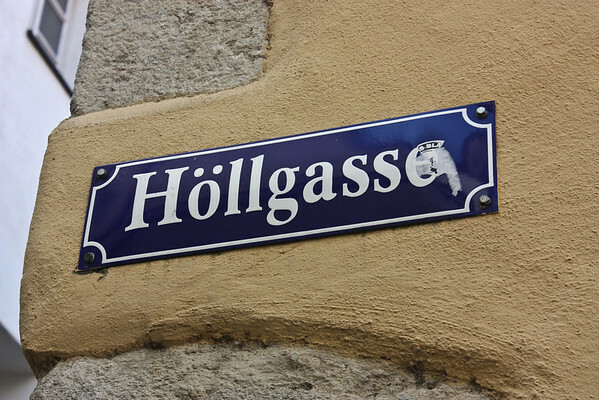 The Höllgasse was full of artisan shops, really charming, many of them hung samples of their work in the air across the very narrow street. 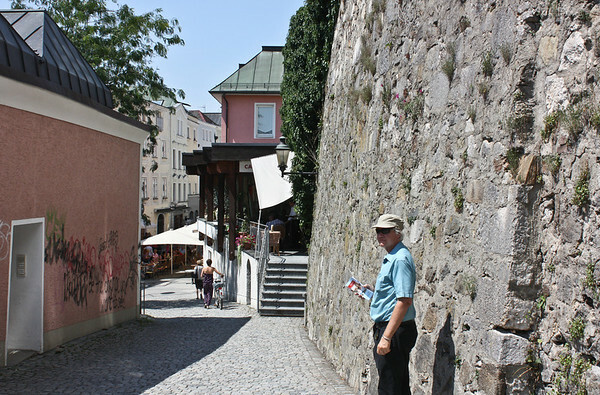 I was sorry we couldn’t spend more time on the tour, because our guide in Passau was Bernard, a Frenchman, who was very witty and funny (and snide about German food and wine!). We all had tickets for the organ concert at the Dom, and we had to be there half an hour early so we could get into the church. St. Stephen’s is huge. I have no idea how many people they got into that church, but the number of doors they had was not adequate for the size of the crowd. They had chairs on every available floor space except the side aisles, and I have memories of people sitting on the floor in the side aisles. Some of them looked like locals, too, not just groups of tourists, although it’s hard to tell. 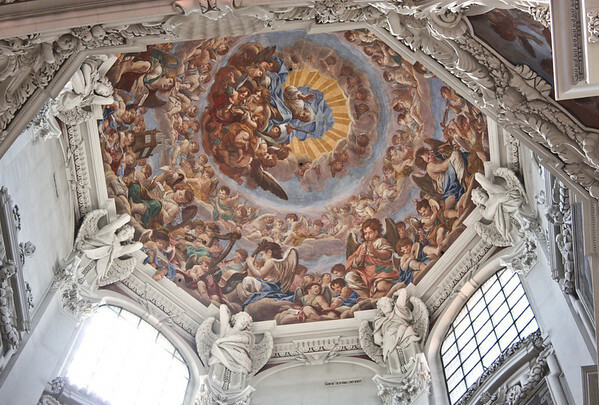 St. Stephen’s is also extremely Baroque. One might even say, Rococo. I mostly have interior shots because much of the exterior was under construction and draped in black plastic. 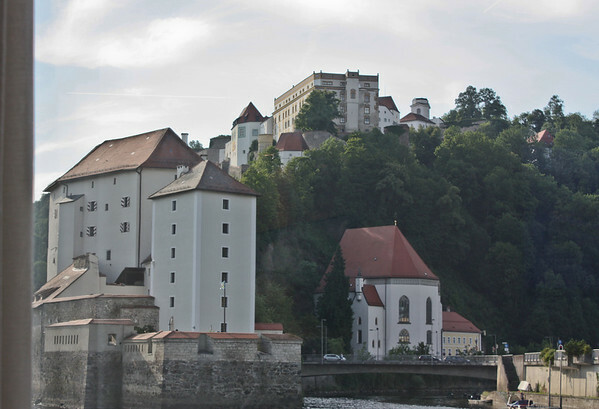 Also, in a tightly built town like Passau, it’s very hard to get far enough away from the Dom to get a good exterior shot. 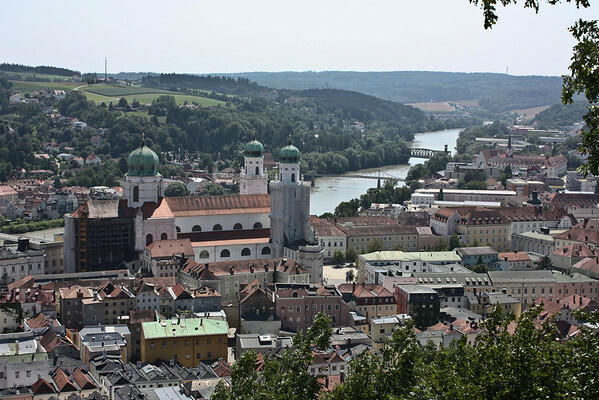 There’s been a church on this site since the 7th century – it’s the diocesan seat of the Bishop of Passau – but the current building was constructed in the late 17th century after a major fire destroyed an earlier building. The organ concert was really something. 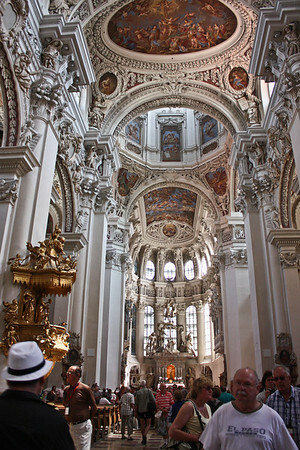 St. Stephen’s has the largest organ outside the United States, and the largest cathedral organ in the world. Yes, they used the 64-foot pipe in the concert, it was amazing. 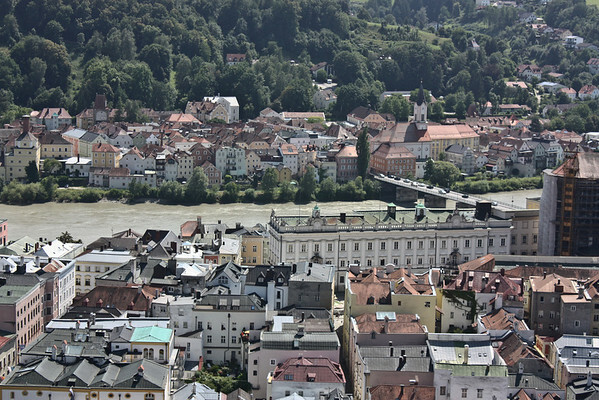 Like most medieval churches, St. Stephen’s was built on the highest ground in town. I remember toiling up the hill to get to it. This gives me hope that the cathedral survived the record floods of June 2013, labeled the worst in 500 years. 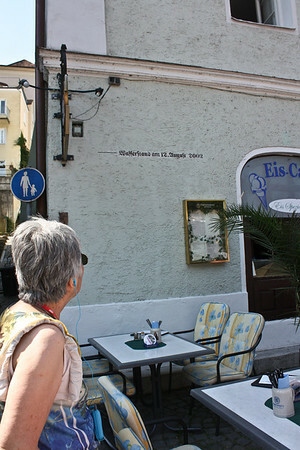 I took a photo of the wall marker for high water in the flood of 2002 (the line on the wall). From the boat I took some pictures of the houses right along the river. It’s a little sad to look at them now as they were almost certainly flooded. 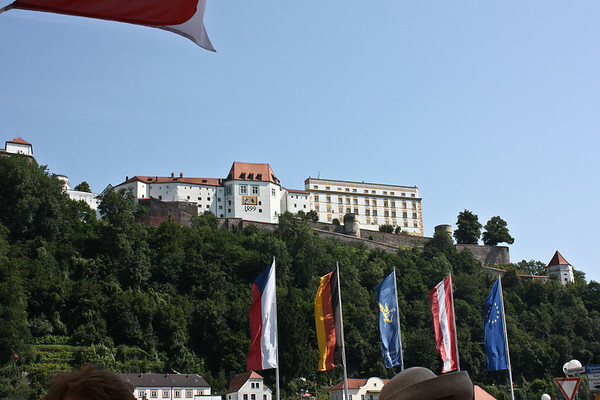 Here are some of the fortifications of the Veste Oberhaus, the former fortress of the bishops of Passau. 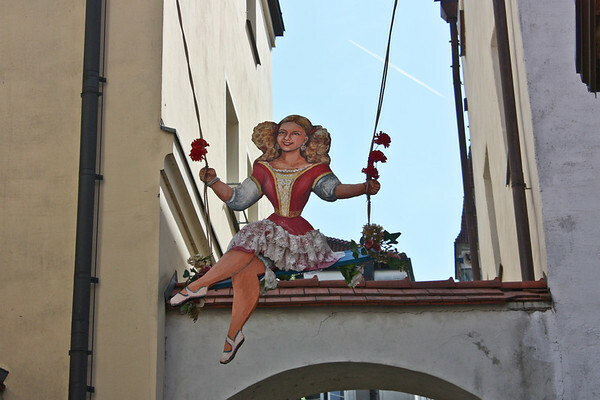 The date on the facade is 1499 but the building was begun in the 13th century. 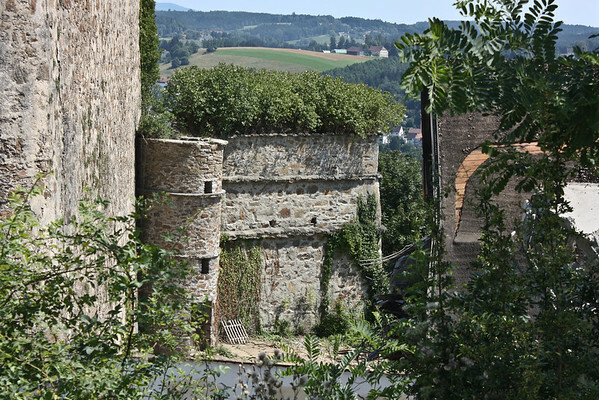 The first photo is the back of the fortifications by our viewpoint; the second is a view across the river, from the town plaza.